Seven years and nearly a dozen movies into what sages will one day call The Age of Marvel, it's pretty easy to spot the tropes that crop up in films produced by Marvel Studios. Chances are that a Marvel film, particularly one launching a new character or set of characters, will revolve around geniuses who have suffered or will suffer some tragic loss, will feature a villain with little of their own personality (unless they're Loki, in which case they'll almost have too much personality), and will probably end with a battle in the sky above a major city. Each film finds ways to differentiate itself from its predecessors, but they tend to follow a fairly well-worn (and immensely lucrative) framework. For Big Hero 6, Disney's first animated feature based on a Marvel property, they don't veer too far from what has worked before. The main character is a science prodigy named Hiro Hamada (voiced by Ryan Potter) whose older brother Tadashi (Daniel Henney) convinces him that he needs to apply his skills with robotics towards something productive, rather than using them to design weak-looking but secretly deadly machines which he uses to win illicit robot fights. Hiro rises to the challenge and designs a horde of microbots: tiny robots capable of forming new structures, and doing more or less anything Hiro wants them to. Tragedy strikes when Hiro presents his creations at an exhibit in the hopes of winning a scholarship to a prestigious university, during which Tadashi perishes in a suspicious fire. Hiro understandably falls into a deep depression, one which is only broken when he discovers that one of his brother's last inventions, a healthcare robot named Baymax (Scott Adsit), is still functioning, and is doggedly determined to fix whatever ails Hiro. Before he has time to fall back into his grief, Hiro and Baymax get caught up in trying to stop a mysterious villain in a kabuki mask from using Hiro's microbots for nefarious purposes, something which requires Baymax to be given a few upgrades, such as rocket fists and the ability to fly, which aren't covered by most healthcare plans. In terms of its basic mechanics as a superhero story, it's not initially clear what Big Hero 6 gains from being animated, as opposed to being made as another addition to the Marvel Cinematic Universe. As that brief summary suggests, a lot of the familiar story beats are there, and a couple more crop up before the credits roll. But as is often the case with Marvel, the differences become clearer once you delve into the specifics. The first major difference is the setting. Where most of the MCU is set in a world which is more or less our own, give or take some technological enhancements and gravitational anomalies, Big Hero 6 takes place in the wholly fictional city of San Fransokyo. As the name suggests, it's a city that blends together aspects of American and Japanese culture to create something which is at once familiar and strikingly new. It's a fairly plausible, if heightened, vision of a future in which cross-cultural pollination reaches its natural end point and everything gets kind of meshed together, with many different elements of our past and present sitting side-by-side. It's a lovingly designed city which has hints of utopianism in it, but also seems like a place in which people might actually live more or less normal lives. It's like a perkier version of Blade Runner's vision of Los Angeles, but with more primary colours and a better public transit system. Beneath the surface of the film's sleek design and seamless animation (not to mention the fact that a futuristic setting allows it to exist separately from the continuity of the MCU) the shift away from live-action gives Big Hero 6 a different emotional tone to its predecessors. In short: being a cartoon allows Big Hero 6 to be both goofier and more earnest than Iron Man et al. While Marvel's live-action films are not as sombre as Christopher Nolan's Batman films, for example, they still aim for a certain degree of seriousness, almost as if they fear that if they were too funny, people might think that a billionaire building himself a rocket suit or a secret government organisation operating out of a flying battleship were somehow ridiculous ideas. They display a knowing sense of humour to let us know that they aren't taking all of this too seriously, but at the same time they want us to take it seriously enough that we care when characters die (if only temporarily) and to invest in the pageantry. Since Big Hero 6 already exists in the heightened context of a cartoon world, it gets to sidestep all of that and be a little bit silly. 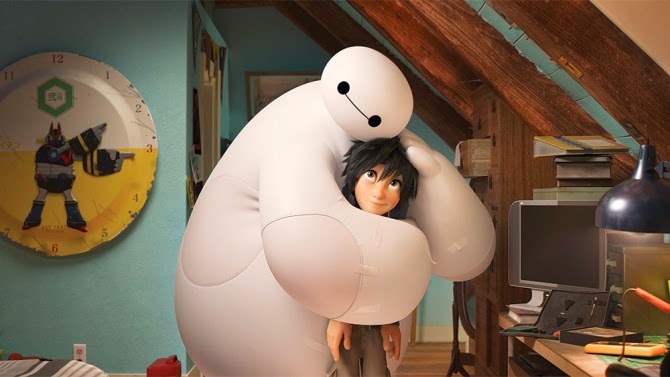 There's plenty of jokes, both broad and subtle, in Baymax's relentless gentleness, the way in which he greets all situations with a mellow, calming serenity that suggests that he's only there to help, even when he is ill-equipped to do so. The other members of the eponymous team, comprised of Tadashi's former lab-mates (voiced by Jamie Chung, Genesis Rodriguez and Damon Wayans, Jr.) and a school mascot who would hang around in the hope of being given superpowers (T.J. Miller), are a lot broader than the supporting characters in Marvel films are typically allowed to be. Miller, in particular, gets to spout lines like "This is our origin story!" which would probably not fly in The Avengers. Even the action sequences, which are delivered with an energy and invention that favourably recalls The Incredibles, go for laughs as often as they go for suspense or excitement. The elasticity of animation gives co-directors Don Hall and Chris Williams a lot of leeway to be light and silly whenever possible. At the same time, the heightened reality of animation that allows characters to say very silly things also allows them to say nakedly emotional things. When you're telling a story in such broad strokes, it's perfectly reasonable to have characters say exactly what they're feeling, without having to couch it in attempts at subtlety. The film grapples pretty openly with Hiro's feelings of grief over his brother's death, something which it uses to create real empathy for him at the beginning, as well as to explore some darker, uglier emotions when it becomes apparent that the film's villain may have had something to do with the fire that killed Tadashi. Hiro's desire for revenge is played very seriously compared to the rest of the film, but it never feels out of place because the whole film is dealing in very big emotions. It also helps that Hiro is a teenager, so he's allowed a certain degree of bigness and melodrama, even if that takes the form of wanting to kill someone. That openness is just one of several ways in which Big Hero 6 recalls Brad Bird's The Iron Giant, another film that managed to wring laughs and tears out of a friendship between a boy and a gentle machine. It's a lofty comparison considering that Bird's film is one of the best animated films of the last twenty years (and one of the best films full stop), and it very nearly, but not quite, meets it. It's a little flabbier, all told, with a mid-film lull that occurs just after Hiro's flirtation with bloodlust and lasts until the film's climax, but even when it feels like it's spinning its wheels it still manages to be a lot of fun. There's something very refreshing in the way that it sets about telling a superhero story with little to no sense that it's just a cog in a bigger machine. Instead, it's content to be its own cuddly, bulbous machine.